Sorry, the final ever print-run is now sold out. Guards! Guards! A Discworld boardgame, the acclaimed first ever character driven Discworld board game, based on the fabulous books of Sir Terry Pratchett. 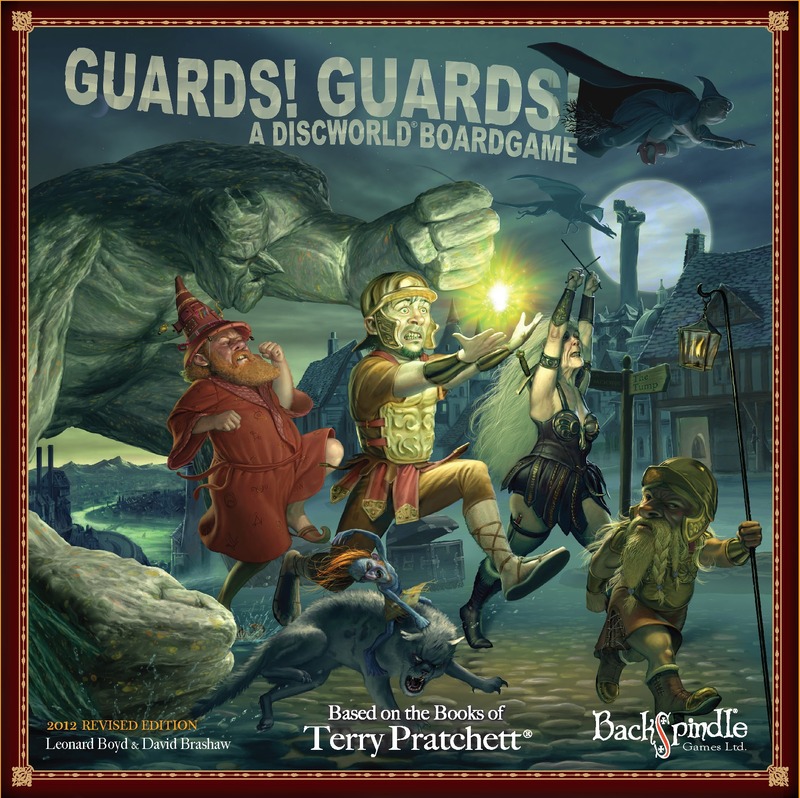 Each game contains ninety beautifully illustrated Discworld character drawings by Stephen Player together with a relevant quote about each taken from one of Sir Terry Pratchett’s books. Guards! Guards! 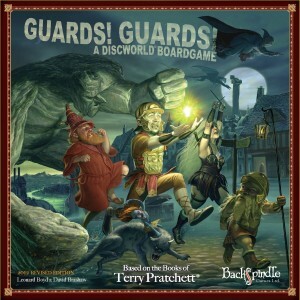 is an action packed, fast paced Discworld game adventure set in the streets of Ankh-Morpork, the Discworld’s oldest, grubbiest and least law-abiding city. Secret societies, rampaging trolls, cut throat street sellers and an 800 pound set of luggage thundering around the city on hundreds of tiny legs. Players need wits and strategy to survive, never mind returning the stolen Great Spells to the Unseen University and saving the Discworld from looming destruction. A fun introduction to the wonderful characters created by Sir Terry Pratchett. In the game Guards Guards players are tasked to collect and return five of the missing Great Spells to the University. Each player selects one of four Guilds to infiltrate, Thieves, Assassins, Alchemists or Fools. Their chosen Guild card will give them a specific selection of the Great Spells to collect and grants them a unique Guild Ability which can be used to hinder their opponents. It is also used to mark the players’ Charm, Guild and Magic abilities, which can be developed throughout the game. Time is short, so rather than returning each Spell in person, the players have been granted the power to recruit the good, and not so good, inhabitants of the city to act as guards and runners to protect and return the Spells to the University. There are fourteen locations on the board where players may Charm (or Bribe) Volunteers to join them on their quest.